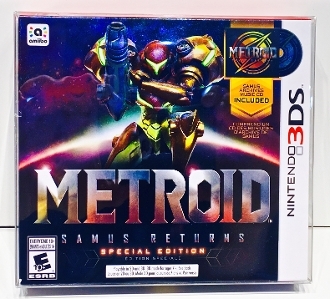 1 box protector for the Metroid Samus Returns Special Edition 3DS NTSC Version. PAL size could be different so please make sure yours will fit in the size listed before purchasing! These are 5 11/16 x 5 1/8 x 15/16 or roughly 14.4 x 13 x 2.4cm. These could also have other uses so if you know of any items the same size please let us know so we can help other collectors looking for solutions for those items.